The streets of Lethbridge will be alive with the sounds and sights of the local arts scene, Sept. 22-30 as Lethbridge Arts Days features events all over the city. There will be buskers on the street, live music, theatre, family fun, concerts, film screenings at the Lethbridge Public Library, artist talks, art exhibits, artisan market and lots more. Simultaneously, New West Theatre’s production of The Million Dollar quartet continues throughout ArtsDays . And exhibits continued at SAAG and Casa. “We have a lot of projects happening at the Allied Arts Council, Casa and downstairs. There are even events at City hall,” said Allied arts Council communication manager Kelaine Devine. “City Hall will be lit up with full lighting red, blue and yellow, the primary colours of art,” she said. “It’s really exciting to have their support,” she said, adding City Hall hosts the Lethbridge Centennial Quilters Guilt’s ArtWalk Quilt show beginning, Sept. 25. A week chock full of artistic opportunities begins Sept. 22 with Word On The Street at the Lethbridge Public Library. “It’s out eighth year,” observed festival director Elisabeth Hegerat. “We have authors coming from Halifax to Victoria,” she said, adding Pauline Dakin who wrote “Run Hide Repeat,” will be a highlight. “She spent most of her childhood on the run. So It’s about her fugitive childhood,” she said, adding there are a variety of different authors including cook book authors, true life drama and comic book artists reading from their works. Some of them will have ASL sign language featured. “Roy MacGregor writes about hockey and his time travelling with his kids across Manitoba,” she added. There will be familiar faces like Clifford the Dog. And the Sik-Ohh-Koytoki Friendship Centre are erecting a teepee for First Nations storytelling. The Nikka Yuko Japanese Centre will also have a presence at the festival. As a bonus, Library memberships will be free during Word on the Street. A lot of art exhibits open on Monday, a youth art exhibit opens at the Helen Schuler Nature Centre and continues through the week, Kylie Fineday opens an exhibit ninoson at Street Legal Records, Arianna Richardson continued her exhibit “The Garbage Party” at Galt Gardens, Sept. 15-21 and then Sept. 22-28 in Indian Battle Park 2-4 p.m. each day, plus 10 a.m.-12 p.m. Sept. 15 and Sept. 22 . Jose Luis Torre‘s opens “The Everyday Future” in the Hess Gallery at the U of L in W600. Dr. Margaret (Marmie) Hess opens an exhibit Walter Phillips in the Helen Christou Gallery. “We have Mimosas, Muffins and movies at Casa on Sunday. We’ll be showing Paolo Ventura: Vanishing Man,” Devine said, adding the film-maker turned from creating art out of found objects to photography images from the second World War. “There are lots of movies happening at the library,” she continued. 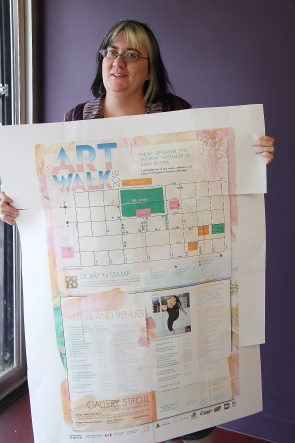 “But the big event is over the past three days when we have ArtWalk Friday through Sunday. There will be artists at 40 venues,” she said art will be created on the spot and artists will be on hand to talk about their art. There are several events at Casa on the weekend. There is an artisans market is in the ATB Room on Sept. 29-30. Over at SAAG there will be a barbecue and beer gardens, Saturday, Sept. 29, where new exhibits open from Althea Thauberger, Vivek Shraya & Cindy Baker. SAAG also features a Creative Centre Family Activities. There will be more family fun outside Casa on Sept. 30 with Family Affair on the Square featuring performances from Karen Romanchuk, , LSIDA, Jon Martin and Kavanagh and Hepher and mi Colombia Linda and others. 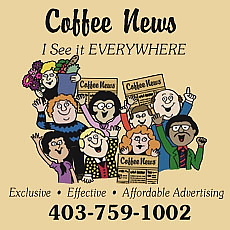 Other highlights will be the historical walking tour of downtown for which Dawn Leite will share some new facts about Lethbridge she has learned. “There is lots of fun and free stuff to do. It’s also an opportunity for creative people to show what they’ve been working on,” she said. “ I just love Arts Days. We’ll all be super-arted up by the end of the week.,” she said.